One of ImportAdvantage’s most-reviewed and top-selling TV lift cabinets is the Banyan Creek TV lift cabinet. Featured on an episode of The Price is Right, the Banyan Creek TV lift cabinet is finished in an inviting and warm brown that highlights the wood’s quality grain. Offering immense room for storage, the Banyan Creek TV lift cabinet will also hold a TV up to 56” wide, 32 ¾” high and weighing up to 130 pounds. 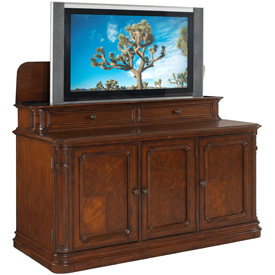 It comes standard with the Uplift 3700 TV lift system and the Infrared Relay System, both pre-installed. This model is perfectly suited for the bedroom or against the wall in your living room. Its elegant design will draw any visitor’s eye and makes it a choice complement to any home’s décor. The center door covers on the Banyan Creek TV lift cabinet can be interchanged with glass, cloth (for speakers) or wood panels, depending on your personal preferences. The cabinet is constructed with select hardwoods and mahogany veneers, giving it a timeless mystique. Take a moment to check out the Banyan Creek TV lift cabinet for yourself or any of the other fine TV lift cabinets from ImportAdvantage.